Barnes & Noble's newest ereader has been on the street for less than a day and it's already gotten its first software update. My first impressions post for the Nook Glowlight Plus was interrupted this evening when it abruptly turned itself on and started downloading an update. According to the changelog that popped up after the Nook restarted, the update added Readouts, B&N's new teaser service. There's a new icon in the menu bar at the bottom of the home screen, and it leads to a menu that wasn't accessible before. I'm not interested in that feature, but I am hoping that the update also fixes some of the software flaws I've seen. I'm not to happy about the hardware design (the bare metal shell and sharp edges do not appeal) but the software is a serious issue. 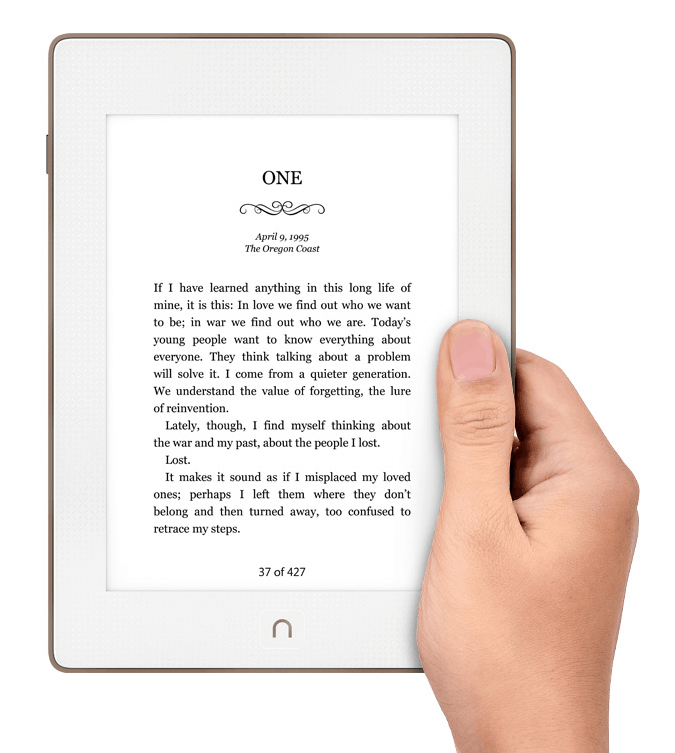 If I had to pick one word to describe the new Nook, it would be senile. Every so often the Nook would suddenly forget the ebooks it was carrying, flash to black/white/black, and then remember the ebooks in its library. There have also been times where it would get confused about the command I just gave it, flash to black/white/black, and then go back to whatever menu I was just looking at. It's a little frustrating, but I hope that B&N can fix it in a software update. In related news, discussions over at MobileRead have turned up an interesting detail about the Glowlight Plus. According to the media fact sheet, this Nook model runs a much newer version of Android than its predecessor. Under the bland Nook software runs Android 4.4 KitKat. That's not the latest cutting edge version of the OS, but it is a lot newer than the Android 2.1 running on the last Nook, or what is running on many Android tablet. The Android version, as well as the 2.8GB accessible storage (I've tested it), has already drawn the attention of a couple members of XDA Forums. No one has stepped forward to say they've started hacking it, but it's only a matter of time. Given the relatively new version of Android and the 300ppi screen, this could make an interesting E-ink Android tablet. But the Glowlight Plus lacks a card slot or Android, two features which can be found on other Android ereaders, so that would make it less than ideal. Instead I would recommend another model. Perhaps one from Icarus, which recently updated their firmware to integrate Scribd. Thee's also the Inkbook Onyx, or the Boyue T62 (which I did not find appealing). They don't have the Glowlight Plus's 300ppi screen, but they do have an open version of Android, a dual-core CPU, and a card slot. No hacking will be required to turn them into Android ereaders because they already are Android ereaders. Apple, Amazon to be Socked With EU Tax Bill? Thank you for a quick review. I personally find the idea of metal body and well defined edges appealing – it would me much easier for me to make a case. By the way, are you planning to get a case? I don’t usually get a case. And I’m not planning to keep this one, so it wouldn’t make sense anyway. I pick one up yesterday and it updated the software immediately. I like the design and pick up the Sleeve instead of a case. So far I have not experienced any of the software issues you mentioned. Also, what are you referring to when you say sharp edges? I was referring to the edge of the metal shell. You could use it to scrape paint. I have a new Glowlight Plus and have not been able to connect to adobe digital editions. I called B&N support and was told techs were working to fix the problem. One week later I called again and was told that Glowlight plus could not be used for library books. I then told him of first support call, he checked and said techs are working on it. I don’t know if they want to fix this or not. Is there a way to fix this myself with your help? Is it all GLP’s that have this problem or just mine. All other devices of mine (nook color & kindleHD) work just fine with my SurfacePro and ADE. Every Plus has this problem, sorry.